Reading through medical reports and submissions in a United States Civil War Union pension case can be exceedingly tedious. Sometimes the amount of detail seems excessive, but one has to remember that these submissions were used to make decisions regarding whether a veteran was qualified for a pension and, if qualified, how much that allowance would be. It was in their best interest to provide as much detail as possible. Sometimes those details can provide a better picture of our ancestor even if it does not answer direct genealogical questions. Other times seemingly offhand comments can result in major breakthroughs. 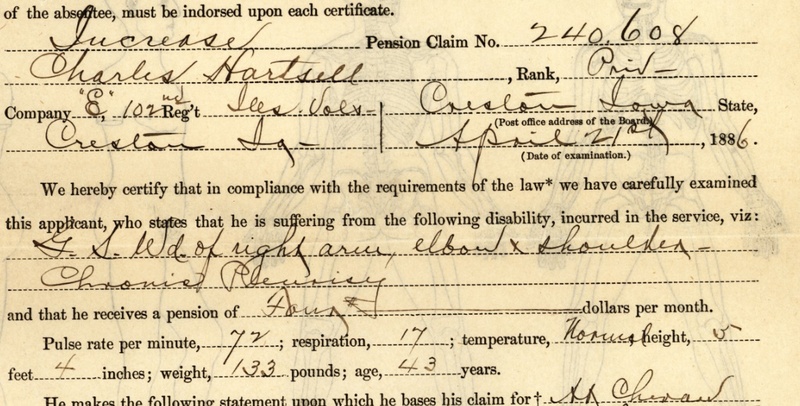 Forty-three year old Civil War veteran Charles Hartsell was applying for a pension increase in 1886. 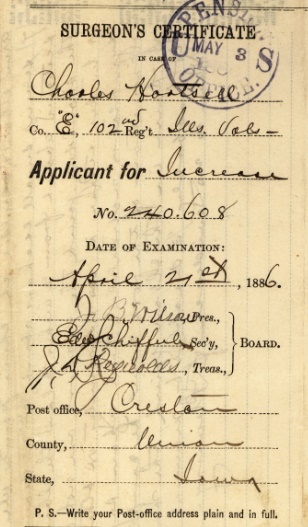 The resident of Creston, Iowa, was examined on 21 April 1886 in Creston, Iowa. The summary of his claim provides a few additional details about his military service. The initial part of the certificate summarizes Hartsell’s military service, his justification for an increase, and physical condition. Often time much of the information is repeated from one claim form to another, but it is always possible that additional details are given in a followup statement. He makes the following statement upon which he bases his claim for At [—] South Carolina in Feby 1865 while on duty he received a G. S. Wd-of right arm, elbow and Shoulder. 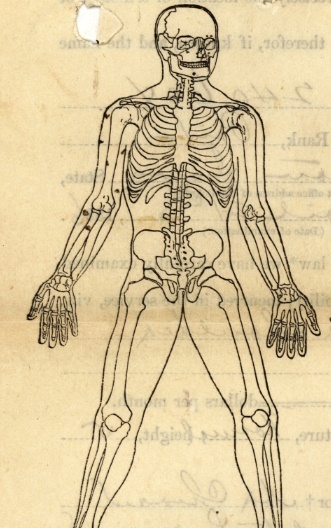 He states he contracted Pleurisy at Galitan Ten–in the winter of 1862&3, & has been afflicted with it ever since. He further states that the disability is increasing & claims an increase on the grounds that his pension is not enough in proportion to his suffering. note: a later report refers to Camden, South Carolina for the location of the gunshot wounds. The doctor summarizes Hartsell’s wounds (including 7 small [—] about 1/8th inch in diameter), but indicated that there was no evidence of pleurisy. The form included blank figures the doctor could use to indicate wounds and there are marks to indicate where Hartsell had injuries. It is indicated that Hartsell is 1/3 disabled in regards to being able to perform manual labor. Medical reports can be used to track migration of a veteran pensioner as their address should be noted on each one. Ages may or may not be entirely consistent. By 1893 things have changed for Charles. That medical exam will be discussed in a future post. These pension records are currently housed at the National Archives in Washington, DC. This entry was posted in Uncategorized and tagged charles hartsell. Bookmark the permalink.